Would you like Learn to Kitesurf having Kitesurfing Lessons Sardinia? how those Kite Lessons and Kite Courses are managed. Learn to Kitesurf in Sardinia, Learn to Kitesurf with KiteGeneration! 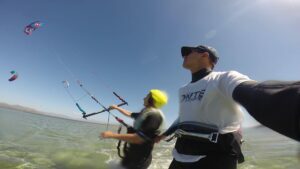 Advanced / Intermediate Kite Course. Strengths of KiteGeneration Kite School. Professional methodology of IKO and FIV for teaching kitesurf. Radio helmets for a perfect communication Student-Instructor. Private or Semi-private Kite Courses and Lessons. Go-Pro to film the kite session. Kite Camp Sardinia and Kite & Sleep Packages in Cagliari and Punta Trettu. Where and What time Kite Lessons take place. Where Kitesurfing Lessons take place. What time kitesurfing lessons start. Prices of Kite Services proposed by KiteGeneration. General Notes on Kite Lessons and Courses. Booking of Kite Lessons, Courses or Kite Camp. KiteGeneration is a Kite & Surf Center in Sardinia located in Cagliari and Punta Trettu. We offer kitesurfing lessons and courses for all levels from complete beginner courses to advanced. All equipment is included in all our kitesurfing lessons and courses. Kitesurfing Lessons and Courses run with small ratios per instructor to focus on personal time, progression & safety of all students. Here under you can find the list of our Kitesurfing Lessons Sardinia and Kite Courses. Book your kite course and learn with us how to kitesurf or improve your kite level. Enjoy Kitesurfing Lessons in Sardinia with KiteGeneration! The Mini Kite Course is the best way to discover kitesurfing. This Kitesurf Course will take you through the steps of piloting a 4 line kite. You will learn about safety and how important it is to this sport. Furthermore, you will be taken through the steps of equipment set up (you will learn how to arm the kite), launching and landing, and controlling. The Mini Kite Course is addressed to people that like to have an introduction of this fantastic sport. Try the Mini Kite Course, we will bet that it will be not the last! The Kite Courses for Beginners are addressed to people that like to learn to kitesurf, from the kite controlling until the glides on the water. We propose different Kite Courses for Beginners. The difference between the courses is their duration. Even if the kite level achieved at the end of the Kite Course could vary between each student, attending a longer kite course you will get better kite skills and level. With a short Kite Course for beginners, you will learnhow to set up and pilot a kite. With a longer course you could learn how to do the body drag, you will practicethe water starts and you will ride on the water.
. During the Kite Courses for Beginners, you will learn how to pilot the kite with power and how to pilot the kite with one hand, you will learn the body dragging. Finally, with the Kite Course for Beginners, you will practice hot getting up on the board for your first ride. Basic Kite Course for Beginners (6 hours of kite course, divided in 2 – 3 days). Classic Kite Course for Beginners (8 hours of Kite Course, divided in 2 – 3 days). Super Kite Course for Beginners (12 hours of kite course, divided in 3 – 4 days). Zero to Hero Kite Course for Beginners (15 hours of kite course, divided in 4 – 5 days). Training with a kite trainer: After 4 hours of lessons, our kiteschool will lend you a Trainer Kite (totally safe) in order you could improve your kite control! In this way, at the next lesson, you will have a plus for continuing your kite course. Kite Tutorial: we will send you some kite manual/tutorial where you could read what you have learned / you will learn in your kite lessons with the instructor, plus some additional notions that usually are not part of the lesson with the instructor. The two above plus are for free! Are you dreaming to be the next world champion of kitesurf? Or would you like just to learn a new fun sport like kitesurfing? In this case, Learn to Kitesurf with the Kitesurfing Course for children! The Kitesurfing Course for kids, aimed to 8-14 years old children, is carried out with the same program of Kitesurfing Course for Beginners with some modifications based on age and weight of child and with a specific gear (kite, board, wetsuit, etc). 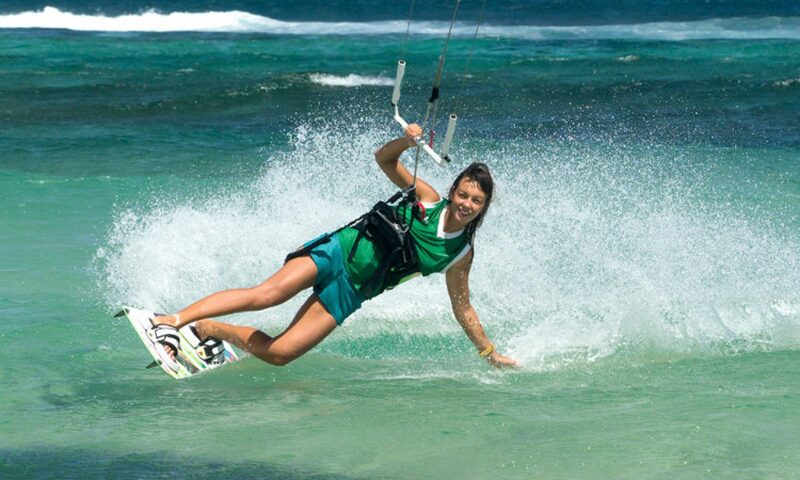 Prices of Kitesurfing Courses for Children is the same of other Kite Courses. the Kitesurfing Lessons per hour, in which you can decide to focus on some particular skills (e.g. Basics, Water start, Riding upwind, Jumping, etc.). learn riding or riding upwind and come back to the starting point. learn changing direction without falling into the water. learn improving the kite style and learn jumping. learn to ride a surfboard. Do it to get a better kite level! Course duration: 2 hours, 3 hours, 8 hours, 12 hours, 15 hours depending on the level and chosen course. A longer course means better skills. Further info on Advanced / Intermediate Kite Course can be found here. 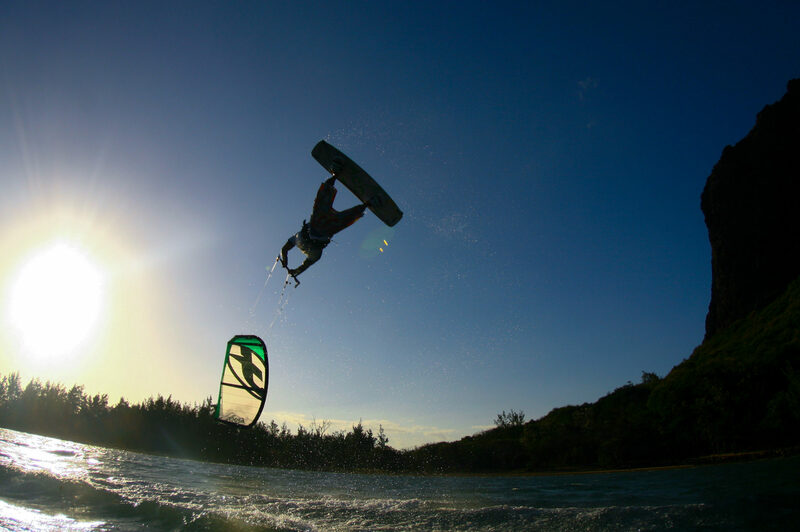 Are you able to kitesurf and do you like to lean a new exciting kind of kitesurfing? 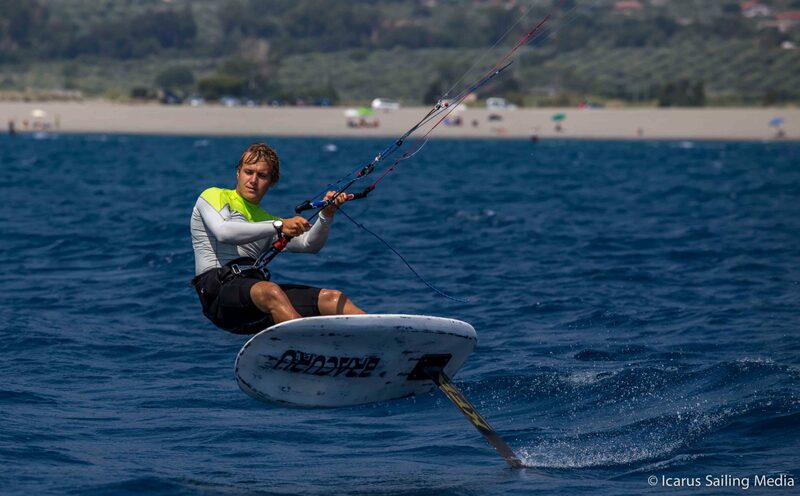 Hydrofoil or Kite Foil Lessons are what you are looking for! Kitesurfing Lessons and Courses proposed by KiteGeneration Kiteschool are organized in order Kitesurfing will be easy to learn and to ensure fun and safety. We assure you that you will learn and / or you will improve in kitesurfing in the easiest, fastest and safest way. easy and safe kite spots. has only qualified and experienced Instructors. uses the professional methodology of IKO and FIV for teaching kitesurf. uses Radio helmets for a perfect communication Student-Instructor. offers only Private or Semi-private Kite Courses and Lessons. lends to the student a Go-Pro to make videos of their kite lessons. 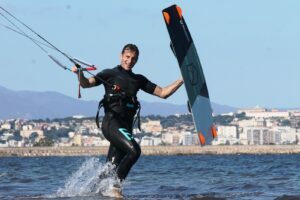 In Sardinia, KiteGeneration has been one of the first kite school (in some cases we are still the only ones) to use the here below listed kite teaching techniques, methodologies and gears. All our kite instructors are Certified with many years experience, and with the skills to teach in all our spots and wind conditions. During our kite lessons and courses we use the teaching methodology of IKO and FIV (Italian Sailing Federation) recognized by ISAF, the International SAiling Federation / Sailing World). KiteGeneration uses Two Way Waterproof Radio Helmets, a real time coaching tool which allows the coach to instantly train and provide feedback to the student and that allow student to replay and ask in real time too. This communication system enables the coach to communicate directly with the student that will instantly receive the instructor’s feedback and could immediately implement his advices. Benefits of this communication system is exceptional! KiteGeneration Kite School is the first kiteschool in Italy and one of the first in the world that is using Two Way Radio Helmets Waterproof! The same Radio Helmet System used by Obama!! KiteGeneration Kiteschool proposes only semi-private (2/3 students and 1 instructor / 1 kite) or private (1 student and 1 instructor / 1 kite) kite lessons and courses. We don’t propose group lessons and courses (4 or more students). Thanks to private or semi-private kite lessons and courses, the kite instructor is 100% focused on the student who can learn and improve as quickly and simply as possible. KiteGeneration Kitesurf Center recommends, when possible, the semi-private kite lessons and courses (2 students – 1 instructor / 1 kite). The semi-private kite lessons, which guarantees an excellent value for money, are divided into sessions of 5/10/15 min each: when one of the two students is “training”, the other one can observe the exercises that the other classmate is doing and easily realize what are the mistakes to avoid and how to carry out the exercise in the proper way. For all 12-hours or above kitesurfing courses, KiteGeneration Kiteschool lends to the students a Go-Pro in order to film the best kite moments! For more information, go to the Kite Go Pro Video Service. And, if you like to have some Drone photo and or professional photo, you can have a Private Photo Shooting with a professional Camera or Drone (extra service). Within your session, the photographer will only focus on you..
Are you looking for a Kite Camp in Sardinia to learn to kitesurf or to progress in kitesurfing? KiteGeneration Kite school offers Kite Camp and Kite & Sleep packages in Sardinia. Kite Camps and Kite & Sleep Packages are addressed to beginners that would like to learn to kitesurf and to Intermediate or Advanced riders that would like to progress in kitesurfing and have a fun. Come to Sardinia and enjoy a Kite Camp or a Kite & Sleep Package by KiteGeneration : let the instructor allow you to achieve your goals and have a fun! Accommodation in renewed rooms with private bathroom in Cagliari and Punta Trettu (accommodation in other locations are not foreseen by our Kite Camp package). Further info on Kite Camp and Kite & Sleep Packages can be found here. KiteGeneration is a Kitesurf Center based both in Punta Trettu and in Cagliari, Sardinia. Usually Punta Trettu and Cagliari are very windy places. But for safety reasons, Kitesurfing should be done with onshore wind. Therefore, for the Kitesurfing Lessons / Courses, if the wind changes direction, we could move daily to different South Sardinia kitesurfing spots. In fact , even if Sardinia is a very windy island (for more info on weather conditions in Sardinia have a look at this article), we can’t guarantee the availability of wind always in the same kite spot. Instead, we can almost always reach a windy kite spot with onshore wind and perfect conditions for kitesurfing! Kite Spots near Cagliari: Poetto Beach of Cagliari, Petrol Beach. We give lessons also in other kite spots of Southern Sardinia (e.g. Villasimius. Chia and Porto Botte), but just in particular cases and conditions. During the summer season, because many beaches are crowded, the most of times our Kitesurfing lessons take place at Petrol Beach or Punta Trettu (the best kite spot is choosen daily depending on wind conditions). Obviously we cannot be sure that it will be windy all days. But moving to different kite spots, and in particular between Cagliari and Punta Trettu, we could offer kite classes almost everyday. In case it will be impossible to complete your course because of lack of wind, you will be refunded in proportion to the taken hours. No refund is provided for other reasons no depending by us or by weather conditions. 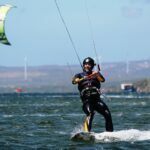 Note on Best Sardinia Kitesurfing Spots: Many people will wonder: which is the best spot for kite surfing in Sardinia, the most beautiful, the one where the wind always blows? Well, it is not existing. In Sardinia the wind direction changes very often and when the wind changes, the kite spot change too. Anyway, the Best Sardinia Kite Spots with high probability of wind are Punta Trettu and the Kite spots around Cagliari e.g., Poetto Beach, Petrol Beach. Kite Lessons usually start after 12 pm, with some cases of early morning classes (starting at 9-10 am) or late afternoon (starting also after 4 pm), when particular weather conditions or several other kite courses are present. You can find all prices for our kitesurfing services at our prices list page. Shuttle Service to the Kitesurfing spots could be offered from Cagliari, with a daily fee. People that like to take this service, will move with the instructors. Expecially during the summer season, the instructors could have several courses: in this case, the students that got the shuttle service, should wait the instructors will finish their lessons before to go back. People that would like to go back immediately after their kite lessons, could ask for a private driver/shuttle service by paying an extra cost (depending on the spot distance from Cagliari the price may vary from 30 to 100 euros: e.g 30 euro from Giorgino, 80 euro from Punta Trettu, 100 euro from Porto Botte; the taxi costs more or less twice than the private shuttle service). Kite Camp Packages includes the normal shuttle service (shuttle service with the instructor). The Kitesurf is suitable for everyone who has a good health and that is capable to swim; only the Mini Kite Course for Beginners could be suitable for people with good health but not capable to swim. The individual attitudes for learning kitesurf can be very different from student to student: they can depend on age, practiced sports, athletic and mental conditions, etc; therefore the time required for learning kitesurf can be different for each student. With the Beginner Kite Course the instructors of Kitegeneration bring the students to control the kite and to have at least the first water-start and glide on the water. Now, what should do is to fill our Kite Form that you can find at this page. Then, if you still need further clarifications, please contact us by using our contact form.